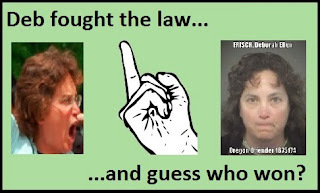 Eugene (June 22)--Ten days ahead of a July 2nd deadline to file paperwork required of her, Oregon Criminal Debbie Frisch has escalated her StalkHarassThreaten strategery, in a second futile attempt to evade the Psych-Evaluation condition of her probation. 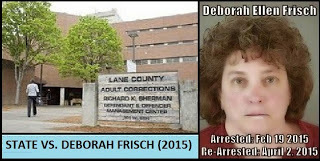 Frisch's past stalking-victims, whose criminal complaints helped precipitate Miss Debbie's Feb 19 arrest this year for stalking (and other charges). In her feverish, futile attempt to evade her probation-requirements, Miss Debbie is filing a flurry of impotent, incompetently drafted "legal motions" with the Lane County Courthouse. Frisch is also sending out toothless tort claims notices by the barrel. Eugene (June 18)--Here we go again? court-imposed probation (which runs through March 2017). of her probation--including the mandatory psych-evaluation. the right to serve any more tort claims until August 2, 2015." Frisch's threats to file frivolous lawsuits against them. 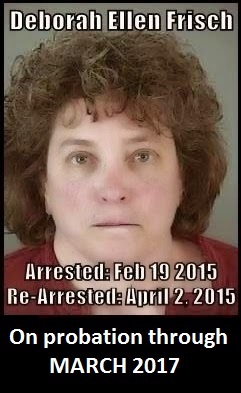 EUGENE, OR (June 10): Two months after her arrest on new criminal charges (and violating the conditions of her 2-year probation sentence), Oregon criminal 1675174 now has another Class A Misdemeanor on her record--and a 90+day suspended jail sentence hanging over her head should she misbehave again. In a court hearing Wednesday, Deborah Ellen Frisch surrendered to the inevitable, but not before hilariously trying to play lawyer. Teh Daily Squeak was fortunate to have an eyewitness to teh clusterphuque yesterday, and agreed to an interview (where smoking was permitted). Teh Daily Squeak: So, Trixter, what was the atmosphere in the hearing-room? Trixter Lom: Very uncomfortable.Only a handful of people at first. Waiting around. Plus, that attempted child-molester from Wales had a hearing. What a circus! Squeak: Since Debbie has the mind of a three-year-old, the waiting must have grated on her. Trix: Of course! There was an elderly lawyer there, with a younger female protege (I gathered). barked at someone not to sit next to her: "I'M REPRESENTING MYSELF!!" she wailed. Squeak: Typical Debbie. She has an obese sense of entitlement. violation, no-contact conditions...) when Debbie starts barking. modest defeat. So how did wannabe lawyer Debbie perform? Trix: So Debbie wants to know if the judge read her "motion." Yes, the judge answered. Trix: The judge was amazingly patient with Debbie. The prosecutors, too. Squeak: The fact that Debbie wasn't slapped in jail on Contempt of Court is evidence of superhuman restraint, on their part. Not to mention suspending the jail sentence. Trix: How ever did you guess?! Squeak: "You're not the boss of me!" The quote that got Debbie arrested her very first time. Trix: So the judge dispenses with the other cases. Efficiently. Professionally. Squeak: It all sounds pro forma. So what, exactly, is the sticking-point? 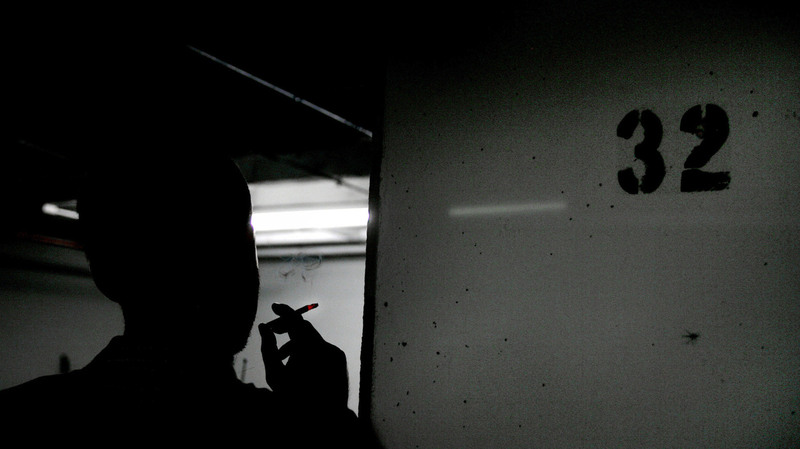 Trix: The requirement that Debbie agree to the psychiatric oversight of QRA. Squeak: Aha, I should have known. Debbie always has been allergic to accountability. Squeak: Typical Debbie: stalk-harass-threaten everyone who has oversight, then demand they recuse themselves for being "biased." Trix: Well, Debbie's lawyering got nowhere: she's still required to obey the psych oversight probation-condition. Squeak: Anything in writing on that? Trix: Debbie signed consent forms, allowing QRA to report whether or not she complies. Squeak: Sounds like the seeds for the next battle have already been sown. Trix: Pretty ironic, since the judge and prosecutors were merciful to a fault. Squeak: Give them ten years. Maybe they'll see the light. Squeak: I suppose there's that. her list of criminal convictions just got longer...with the stroke of a pen. Trix: We'd better leave, though, before the cigarette-police swoop down on us! FRISCH SHOUTS SHE WANTS NO ONE SITTING NEXT TO HER. "I'M REPRESENTING MYSELF!!" (3:08PM)...FRUSTRATED DEBBIE DEMANDS "PRIVATE MEETING" WITH JUDGE...DENIED! (3:12PM)...DEBBIE ACCUSES JUDGE OF "PERJURY"
(4:25PM) CONFIRMED: DEBBIE TAKES DEAL. Eugene (June 10)--The Lane County Court website added a June 10th date to the Frisch docket last week; the event is described as a "Pre-Trial Conference." "Motion to Dismiss" the charges against her, as well as making masturbatory "TORT CLAIMS" threats. If Miss Debbie rejects the present deal, authorities have scheduled a July 1st trial for Debbie's latest criminal behavior. take her consequences, rather than risk a certain beatdown at trial. The Lane County Court website added a June 10th date to the Frisch docket today; the event is described as a "Pre-Trial Conference." Miss Debbie was begging for such a conference yesterday morning, in frantic voice-mails Frisch allegedly left with various court officials, begging to accept a deal she'd briefly considered Sunday. Details of the plea are as yet unknown. Teh move marks an abrupt about-face for Debbie, who's spent the last two weeks pursuing a frenzied, frivolous StalkHarassThreaten scorched-earth strategery to evade responsibility for crimes she committed in February and March.